Following a series of street scenes of 1893, in 1897 Pissarro again turned to the capital for the subject-matter and at first produced a handful of scenes of the rue Saint-Lazare and rue Amsterdam. He then painted a more ambitious series of 14 views of the boulevard Montmartre plus two of the boulevard des Italiens, these latter being "terribly difficult views" according to the artist. Based in the Grand Hotel de Russie, he used one viewpoint for the boulevard Montmartre scenes and another for both of the boulevard des Italiens pictures. Like Monet in his series paintings, Pissarro wanted to capture the effects caused by changes in light and season and he even painted a night view of the boulevard Montmartre. 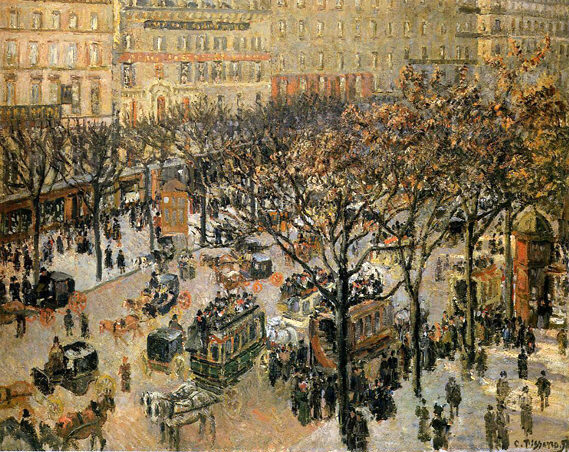 In contrast, however, and at a time when the other Impressionists had mostly given up urban themes, Pissarro was also concerned with the human activity of the street: three of the boulevard Montmartre scenes show a Shrove Tuesday carnival filling the boulevard with tightly packed figures. The cool, morning light of this work contrasts with the radiant illumination of its companion piece, which is filled with the raking glow of the afternoon. Here, the pavement, carriages and buses are crowded with people and the density of the figures allows little room for individualization. This anonymity is further enhanced by the uniform black clothing of most of the figures. The color scheme of the work tends to blend the people into indistinct masses that merge with their surroundings: the dabs of color on the trees are indistinguishable from those representing faces. The grandeur of the great boulevards of Paris is powerfully suggested by the way the buildings, with their regular architecture, rise above the street to the top of the picture, dwarfing the activity below. To a greater degree than can be found in other Impressionist images of the city, the works of Pissarro's series capture the energy and life of the streets. In their dynamism they look forward to the city paintings of the German Expressionists in the early twentieth century.